Hi Tom! 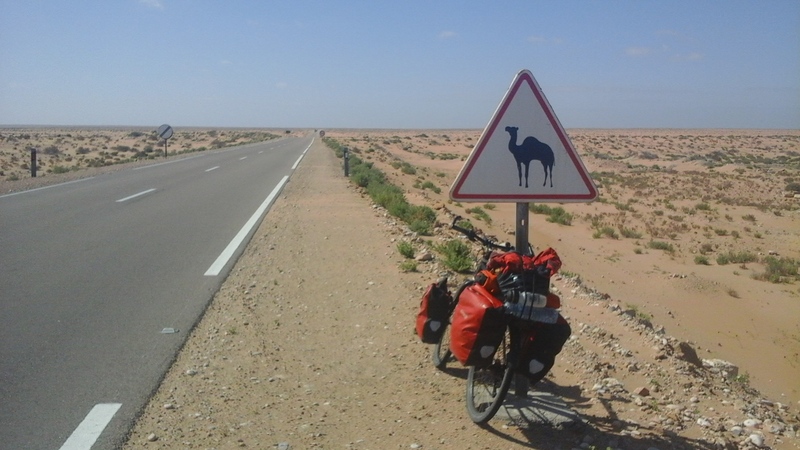 You recently cycled across the Sahara desert – is that right? Totally human powered. 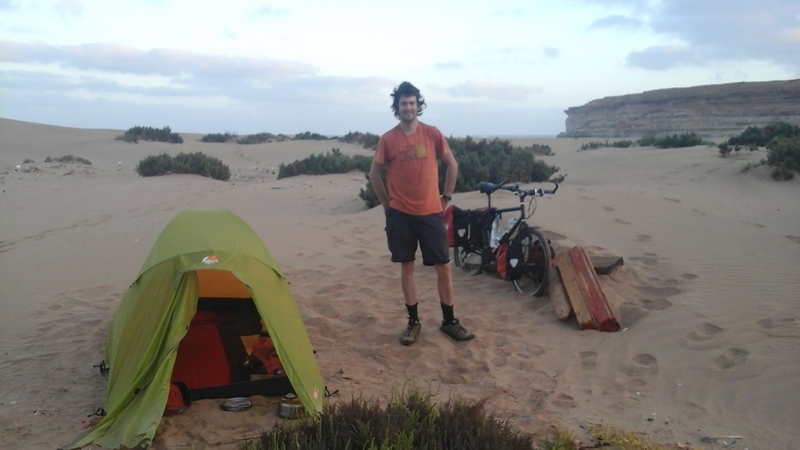 The whole quest (including the 6 month cycle from Scotland to the Sahara! ), no buses, no trains, no hitch-hiking (except in France when my bike broke, I hitch-hiked for 50 km with the bike to a bike shop!). Anyway I’m slightly digressing from this Sahara interview! Blimey.. How did that feel? Can you tell us what was going through your head on the road? Was good fun, the scenery was spectacular and would change fairly regularly from ocean into more rugged sandy terrain. No day was same out there… I was never bored, I was constantly busy, pedaling long distances each day. The remoteness at times did make me question what I was doing but I just kept going.. it was almost exciting wondering what the road had in store for me and what was gonna happen next. Where did you start, and how far did you cycle in total? 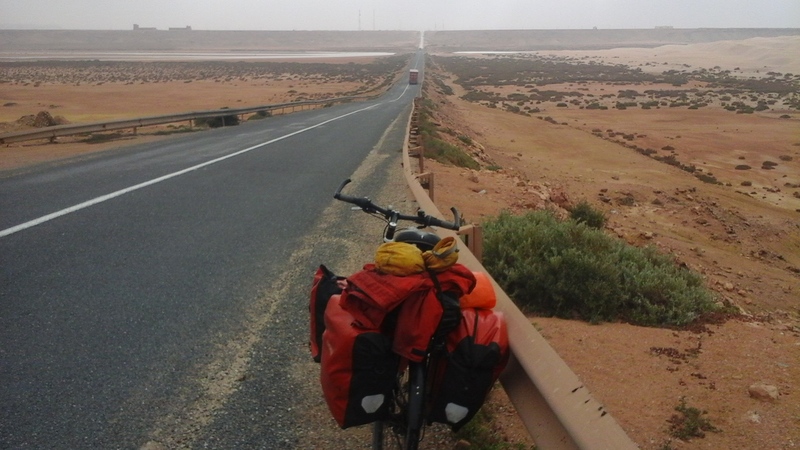 I started in Guelmim (the gate of the Sahara) and cycled to Dakhla just short of the Mauritania frontier. The total distance was 1000 km (600 miles) which took 2 weeks to complete. The distance I cycled averaged 100 km each day. What planning did you do? Did you have to change any of those plans on the road? I also managed to locate a list of the places where I could get food and water between the cities. I had this written down in a black book in one of my panniers. Take the CTM bus to the nearest Saharan city. It will stop on the road and carry the bike in the hold. Hitch-hike with a car or lorry. Flag down the Morrocan Military/police and ask for assistance (as the very last resort). Glad you didn’t need them. Did you take any rest days? I took 3 days rest in Boujdour on day 9. That was partly due to sore knees! I’m told this is fairly common in long-distance cyclists. 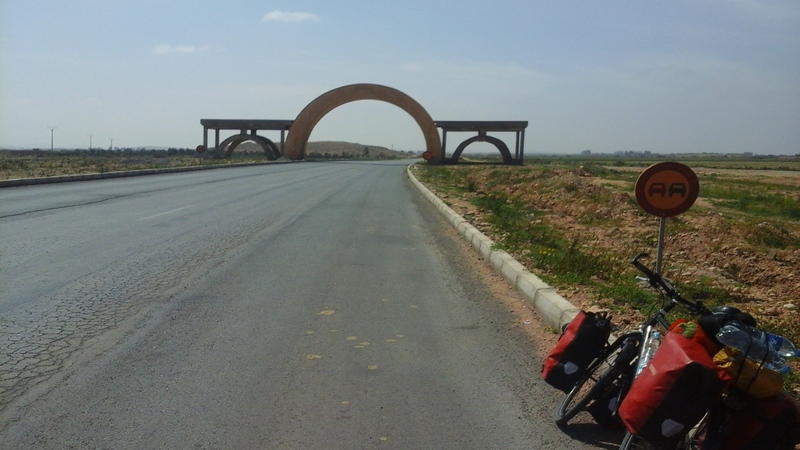 The rest prepared me well for next stage; a 350 km cycle from Boujdour to Dakhla. Yeah lots! I had 2 nights camping out in the desert at army bases. They gave me food (octopus one night!) and somewhere safe to camp. One base was [in charge of] patrolling the waters from the Canary Islands and the other was a checkpoint for traffic travelling through the Sahara. It was pretty surreal waking up in an army base, but they were very friendly; was a good laugh! Other acts of kindness included a couple of strangers who stopped in their car and gave me water and food! They were going the opposite way, in the middle of nowhere; they pulled over, said hello and gave me supplies. Police were also very helpful making sure I was safe….apart from one, he wanted my bike (and bags!!). How did you find help – do you find it, or does it find you? Help always found me… I never had to look for it! Most people want you to succeed; I received many acts of random kindness, usually every day – people just helped me out in different ways. Even with supplies I can imagine hydration would be an issue. What did you use? I carried on average 6 – 10 litres of water per day and a mixture of food (fruit, chocolate, fish, pasta and tuna). This was enough to keep me alive and fuel me for the days on the road. Do you now know how to mix hydration salts from scratch? Do you have any special recipes? I don’t do this, I find ordinary foods and water is enough for this sort of endurance. Just me then. And, it has to be asked, why did you do it? What made you want to? Good question! The idea of pedaling through desert for days on end sounded pretty cool, I wanted a challenge and to have an adventure. The Sahara gave me both. I really didn’t know what to expect, almost like pedaling into the unknown, I was up for the challenge. It was tough but an enjoyable experience. Can you describe your best and lowest moments during the trip? The lowest moments in the Sahara were probably [due to] the conditions; the winds at times were almost unbearable, you want to just die! The winds would spray sand off the sand dunes covering me in sand; I had to cover my face up with a turban and pedal through. On the plus-side, the policeman in the next town sorted out a free hotel for me for the night. Best hotel I stayed in whole of Morrocco!! (Think it was because conditions were pretty bad!). The best moment was probably getting to the end. 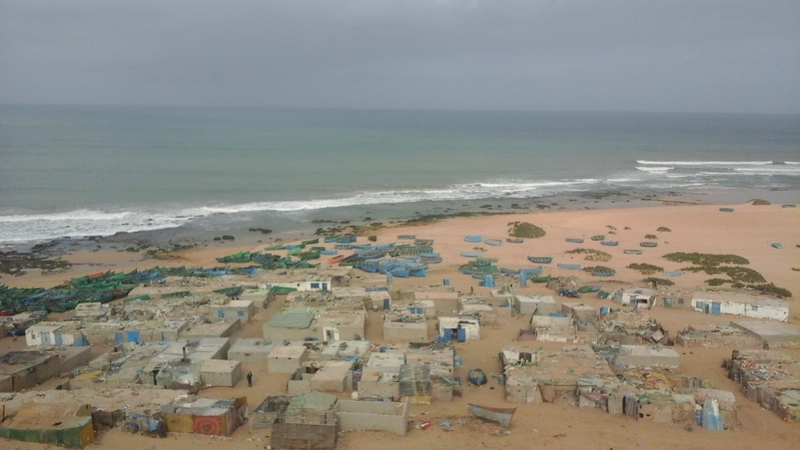 It was a relief more than anything, seeing the sign Dakhla. It was a relief knowing I made it. The policeman even gave me a cup of tea at the Dakhla check point! Essential! And how about equipment? As a cyclist, I want to know, what bike do you need and what tyres?! I ride a Marin Muirwoods, cost me £100 from second hand bike shop in Edinburgh! I’ve been told it’s about fifteen years old! I changed the tyres to Schwalbe Marathon Plus. Great on the road and essential for this sort of tour. I find it quite a debatable topic, which bike to ride for the big tours. Some people opt for really expensive ‘super-tourers’. I think more from a perspective of safety and reliability. Mine has been perfect for what I’ve set out to do. I’ve replaced some of the parts during the trip with Shimano components (for example the cassette and chain) which has provided me with good reliability on the road and kept me pedaling! Good roads!! How many punctures did you get? Can tyres explode from the heat? Thankfully no punctures, I was slightly concerned the tyres would explode, luckily they didn’t! I almost snapped my derailleur though, lent it against a brick wall and it slipped, no idea what I would have done if it had! Luckily no other problems with the bike, just kept the chain well oiled and inspected it from day to day. The bike was fully serviced before commencing the journey. How does it feel to be finished? What are you going to do next? Feels great but it was only really a stage of the trip, a big challenge but the next chapter was definitely my most challenging and ambitious quest yet! My friend Angus Doig from Edinburgh flew out to Gibraltar where we peddled 2800 km together for two months to the city of Santander. That brings us up to now. The next part of journey, I will continue alone as before, peddling through the Pyrenees mountain range, France, Italy, Eastern Europe and Northern Europe, free camping and cycling all the way, eventually back to Scotland. Advice to other (what I can only call) extreme cycle-tourists? If you have any questions, don’t hesitate to get in touch with me. Go!! 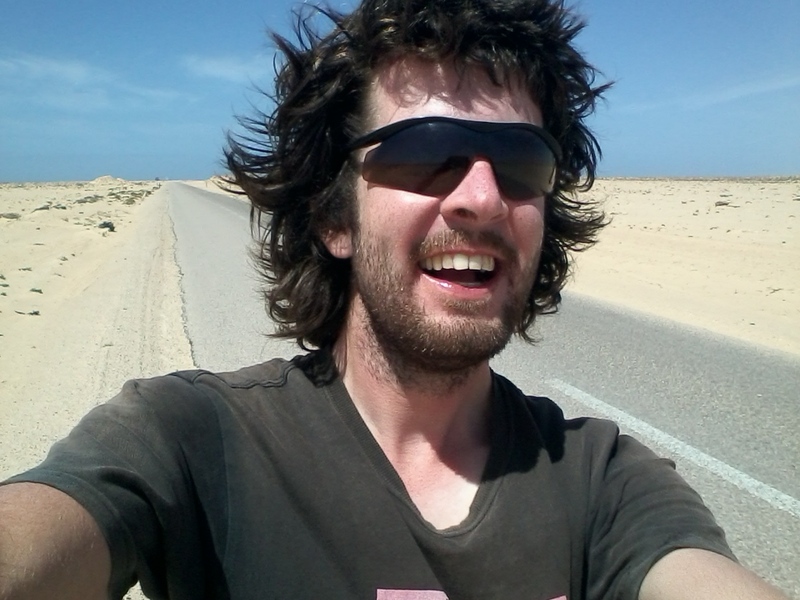 Thomas Gaughan is regularly photographing, video blogging and documenting his journey via Facebook.